Norway’s Aksel Lund Svindal talks to reporters after finishing third in Friday’s Birds of Prey downhill (David O. Williams photo). Norway’s Aksel Lund Svindal knows what it’s like to come back from injury to take on one of your favorite ski-racing venues. The Norwegian superstar suffered a terrible injury at Beaver Creek in 2007, only to come back and win twice on the Birds of Prey track in 2008. So the four-time Olympic medalist totally understood Lindsey Vonn’s decision on Friday to return for one more World Cup season after a recent knee injury cost her the chance to race this weekend at Lake Louise, Canada, where she has won 18 times in her illustrious career. Vonn had previously said this would be her last season, but a training crash tweaked a knee and caused her to miss this season’s Lake Louise speed races, where EagleVail’s Mikaela Shiffrin finished 9th on Friday. Vonn said she’ll return next year for a Lake Louise swansong. 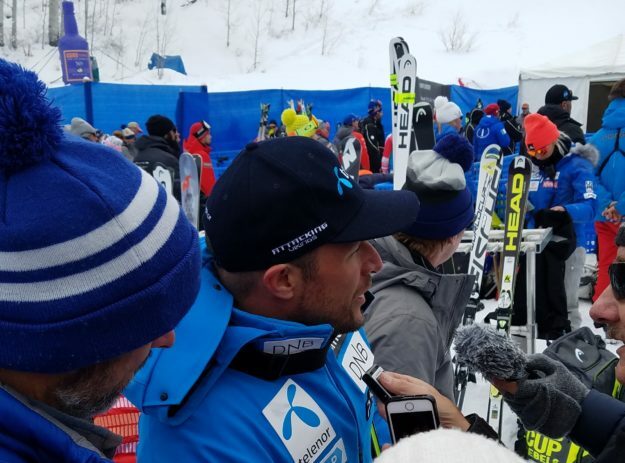 Svindal has won six times at Beaver Creek, or more than 17 percent of his 35 career wins. On Friday, he missed a seventh win by less than a 10th of a second. Beat Feuz of Switzerland won with a time of 1 minute, 13.59 second, followed by countryman Mauro Caviezel in second at 1:13.66, and Svindal in third at 1:13.67 — just .08 back. For the U.S. Ski Team, Steve Nyman and Bryce Bennett tied for 9th at 1:14.15. In fact, both American racers are among the tallest on the circuit, but Nyman, 36, is 10 years older than Bennett. Nyman, who’s stood on podiums (top 3) at Beaver Creek but never won on the Birds of Prey, has battled back from numerous injuries in recent years. The Birds of Prey races, free and open to the public, continue on Saturday with the super-G scheduled for 11 a.m. Go the Vail Valley Foundation website for more details.